The Altogen-96 human cancer cell line panel enables researchers to screen the activity of their anti-cancer compound against 96 human cancer cell lines. Historically, human cancer cell lines have been in individual experiments as well as in small sets to screen novel anti-cancer compounds. This is typically performed by transfecting siRNA, miRNA or plasmid DNA using lipid transfection, or by simply adding the small molecule of interest onto the plated cells. However, this narrow view of anti-proliferation can lead to false-negatives; i.e., a novel compound may exhibit mild results when screening only lung cancer cell lines but might be more efficacious in prostate and kidney cancer cell lines. The lack of screening additional cancer types has led to missed opportunities for new cancer therapeutics. The Altogen-96 panel is comprised of cell lines that represent 11 different cancer types: melanoma, leukemia, colon, lung, kidney, breast, pancreas, prostate, stomach, ovary and brain. 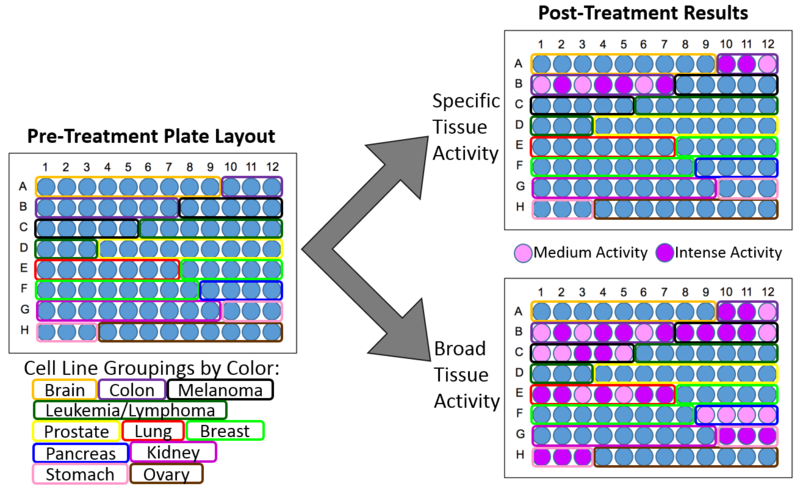 The cell line list included in the Altogen-96 panel contains a majority of the same cell lines used in the NCI-60 human cancer cell line screen panel and are well characterized in regards to their genotype and phenotype, including databases available to download RNA expression data, protein expression data, epigenetics and DNA sequencing information. The Altogen-96 cancer cell line screen is distinct such that the screening of a single compound can yield results across 96 different cancer cell lines. The resultant anti-proliferation data combined with characterization information in databases enables bioinformatics to determine the mechanism of action of a test compound. In addition, the inclusion of multiple cancer types in the Altogen-96 cell line panel allows researchers to expand coverage of their compound to tissues not currently being pursued. The resultant data becomes extremely important in downstream intellectual property filings (i.e. patents) so that all cancer types are covered. Screening of the 96 cancer cell lines is performed following typical, aseptic cell culture techniques. Briefly, cancer cells are seeded in 96-well plates at the appropriate cell density. Using specifics provided by the customer, the test compound is added to the wells at a specified concentration or over a dilution range and incubated to determine growth inhibition. Commonly utilized metabolic assays (e.g. MTT, Alamarblue) or a protein specific fluorescent dye (e.g. sulphorhodamine B) are used to quantify a change in cell number. Hierarchical clustering by the expression patterns produces a visual tool that shows segregation effect based on the tissue of origin. The cells that respond to the test compound signal which cells were sensitive to an agent and which were more resistant. Resultant screening data from the Altogen-96 cancer cell line panel will exhibit activity of the test agent as either having a narrow, tissue-specific effect (e.g. anti-proliferation effect only melanoma cancer cells) or having a broad tissue effect (e.g. anti-proliferation effect in multiple different cancer cell tissues). In regards to specific tissue activity exhibiting a sub-population of cells with intense activity, the future direction of therapeutic pipelines may be altered to focus treatment on cells or patients containing those similar expression patterns, INDELs or mutations. Alternatively, post-screening results may indicate to the customer that the main area of focus should shift to a different tissue or disease. With any large screening tool, a good bioinformatics tool can dig deeper into the dataset. By combining the Altogen-96 human cancer cell line panel anti-proliferation results with publicly available databases on RNA or protein expression, INDELs, mutations or DNA sequencing information, researchers may be able to assign a putative mechanism of action or determine a specific biomarker to a test compound.